Electrical and optical engineers in Australia have designed a novel platform that could tailor telecommunication and optical transmissions. Collaborating scientists from the University of New South Wales in Sydney and Canberra, the University of Adelaide, the University of South Australia and the Australian National University experimentally demonstrated their system using a new transmission wavelength with a higher bandwidth capacity than those currently used in wireless communication. Reported this week in APL Photonics, these experiments open up new horizons in communication and photonics technology. Optical fibers are the frontrunners in fast data transmission, with data encoded as microwave radiation. Microwave radiation is a type of electromagnetic radiation with longer wavelengths, and therefore lower frequencies, than visible light. Current microwave wireless networks operate at a low gigahertz frequency bandwidth. In our current digital age that demands speedy transmission of large amounts of data, the limitations of microwave bandwidths become more increasingly more apparent. In this study, scientists examined terahertz radiation, which has shorter wavelengths than microwaves and therefore has higher bandwidth capacity for data transmission. Furthermore, terahertz radiation provides a more focused signal that could improve the efficiency of communication stations and reduce power consumption of mobile towers. "I think moving into terahertz frequencies will be the future of wireless communications," said Shaghik Atakaramians, an author on the paper. However, scientists have been unable to develop a terahertz magnetic source, a necessary step to harness the magnetic nature of light for terahertz devices. The researchers investigated how the pattern of terahertz waves changes on interaction with an object. 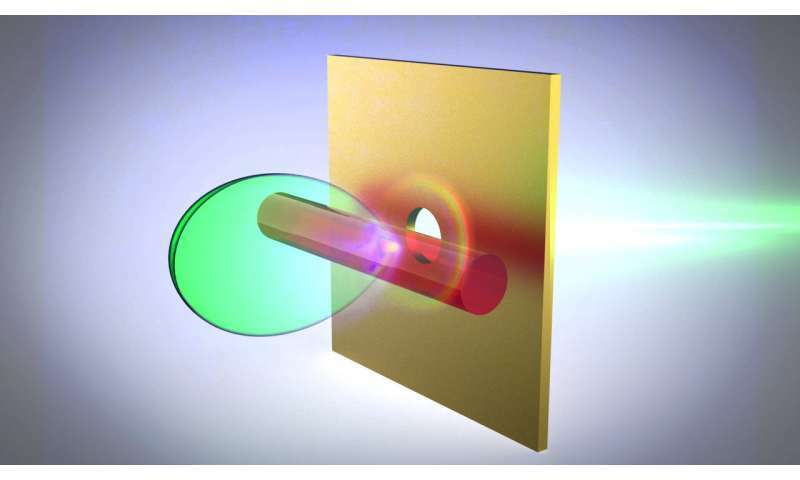 In previous work, Atakaramians and collaborators proposed that a magnetic terahertz source could theoretically be produced when a point source is directed through a subwavelength fiber, a fiber with a smaller diameter than the radiation wavelength. In this study, they experimentally demonstrated their concept using a simple setup—directing terahertz radiation through a narrow hole adjacent to a fiber of a subwavelength diameter. The fiber was made of a glass material that supports a circulating electric field, which is crucial for magnetic induction and enhancement in terahertz radiation. "Creating terahertz magnetic sources opens up new directions for us," Atakaramians said. Terahertz magnetic sources could help the development of micro- and nanodevices. For example, terahertz security screenings at airports could reveal hidden items and explosive materials as effectively as X-rays, but without the dangers of X-ray ionization. Another advantage of the source-fiber platform, in this case using a magnetic terahertz source, is the proven ability to alter the enhancement of the terahertz transmissions by tweaking the system. "We could define the type of response we were getting from the system by changing the relative orientation of the source and fiber," Atakaramians said. Atakaramians emphasized that this ability to selectively enhance radiation isn't limited to terahertz wavelengths. "The conceptual significance here is applicable to the entire electromagnetic spectrum and atomic radiation sources," said Shahraam Afshar, the research director. This opens up new doors of development in a wide range of nanotechnologies and quantum technologies such as quantum signal processing. Since you're working on frequencies shorter than microwaves (i.e. shorter than e.g. the wavelength that stimulates vibration in H2O bonds) it's not immediately apparent where health issues could develop (of course this doesn't mean there absolutely will be none, but currently there's no known mechanism that suggests there would be). Also the energies employed are very low. What Is The Effect of WiFi Radiation On Us?